Another volume in the epic saga that is INJUSTICE GODS AMONG US has made us almost instantly snatching for the comic apps once more. The seat gripping installment was devoured within almost minutes and left me gagging at the bit for the next issue already, it was just that good. Like an addictive drug, INJUSTICE is catnip to DC readers everywhere and has lived up to expectations once again. The story continues with its tale of the tittering universal wars, Earth and its psycho Superman smack bang between the Green and Yellow Lantern Corps unending rivalry. As much as both teams are massive units, Tom Taylor, who has been crafting the glorious words that spill from these characters with each breath they take, has once again shown the utmost respect to the classic Corps. Giving a high level of regality to the Green Lanterns but also the soul chilling loose lips that have made the Yellow Lantern Corps so famous to what they do best. As another desperate character or should I say Despero, races to Earth we see Sinestro intercept, playing the part of the lying hero all too well as he falsely engages into a fight with the alien, only to turn his head a little more than natural. 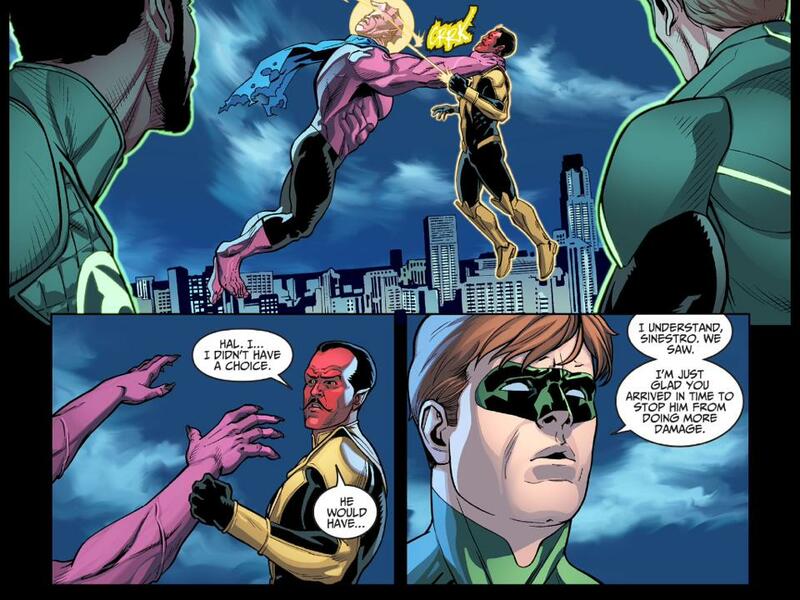 What appeared to Hal and John as Despero chocking the fear monger, seemed to be all the evidence that they needed to change their options rapidly not blaming Sinestro for what had he had done. The sly execution of his act once more let the red devil slide past the alarm bells of worry and pulled the heroes into a twisted euphoria of his good deeds. 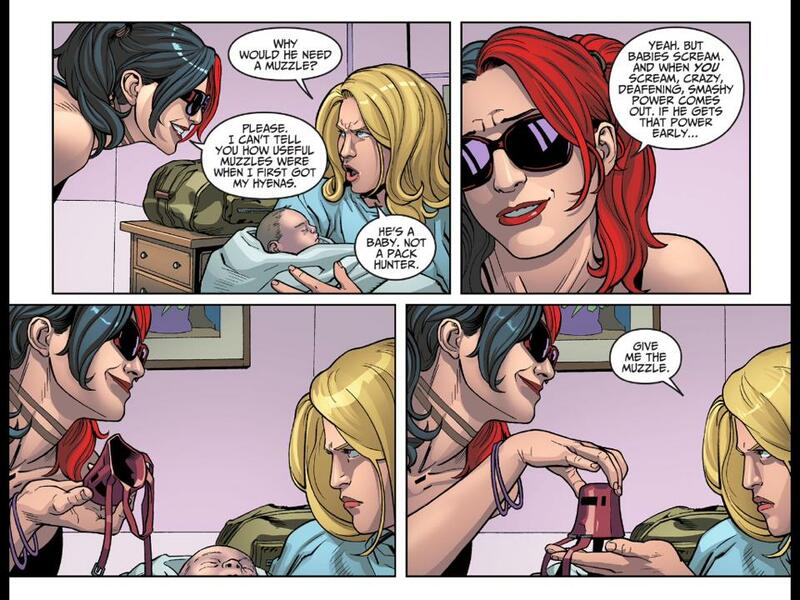 Though not everything in the devastated world is doom and gloom, Harley visits Dinah after she has given birth to a baby boy, showing a more caring side to the eccentric villain now turned hero as she brings a baby bow and arrow set to remind her of Ollie, a fake moustache to give a touch of her own randomness and finally a muzzle that had the Black Canary debating the fact her child was not a laughing dog until Harley points out that the crying and screaming from this baby, may not be the same as a normal one. The injection of comedy will keep readers smiling with every syllable before Dinah’s duty as leader to the Birds of Prey spoils what should have been her proudest moment. But when the Green Lanterns are bringing you an entire planet to wage war on, you always answer that call. The artwork again is nothing short of flawless, with the darkened realistic tones and highly articulated character designs of Bruno Redondo, Julien Hugonnard-Bert and Rex Lokus capture the very essence of emotion packed expressions which draws the reader’s attention and makes them hold their breath as if they too, were part of the story. As much as I’m not a fan of babies, we see the birth of Ollie’s kid. The baby boy is sped up fast forwarding eight months and while it is practical we didn’t get the chance to laugh at a pregnant Black Canary, I guess that’s just the Harley in me seeping out. Though not much is negative about the issue, the introduction to the farce Sinestro is playing as rather hastened as well. It hits you like a good unexpected punch to the face leaving you a bit confused as to what was going on while you were away. Possibly a few more details or a flashback panel could have improved his stance and exposed another thread of detail to the execution of the grand plan. This issue has made me want to write to Tom Taylor begging him to accelerate his fingers and bring more thrilling moments to our eyes. If you find yourself wondering why you haven’t read INJUSTICE yet, stop thinking and start reading as you won’t regret it. The issue was another chocolate of mysterious delights, unwrapped for the reader’s senses and no doubt the next one picked up will be even better than the last. Will the Joker be in every episode of Gotham?